The majority of people who get measles are unvaccinated according to the CDC. Measles can spread when it reaches a community where groups of people are unvaccinated. The largest outbreak in California was from Dec. 2014 to April 2015 when 131 people were infected after an outbreak involving Disneyland. 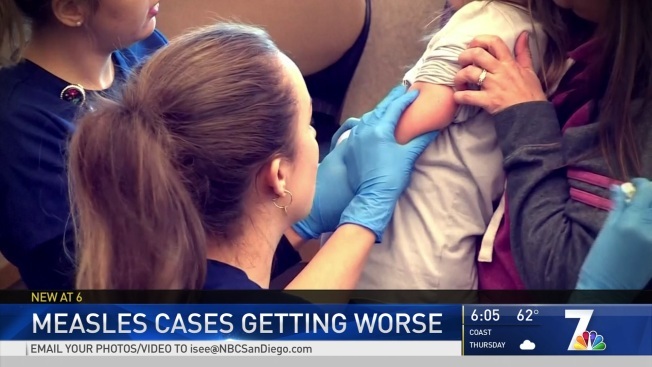 A surge in new measles cases across the country has San Diego doctors on high alert. With 555 cases of the measles reported in 20 states this year alone, including 21 in California, the Centers for Disease Control and Prevention says this is the second highest number of cases since the disease was considered eliminated in 2000. San Diego County officials believe it's only a matter of time before a case shows up here. To give you an idea of just how contagious the virus is, one could cough in a medium-sized room and the germs could linger there for up to two hours and sicken people who entered the room even if the one who coughed was no longer there. And that’s why experts are taking these outbreaks so seriously. As the oldest of her cousins and the other Ocean Beach neighborhood kids growing up, Mari Ridenour, a former preschool aide, found a calling early. “I was pretty much 'Number One Babysitter' since I was 10 or so years old,” she said. The only part of her job she didn’t love was when her kids got sick. “It spreads like wildfire,” she said. She remembered one summer when pink eye, lice and MRSA even got the teachers sick. “It was like a cesspool of germs. It was kind of a nightmare," she said. News that measles was spreading across the country worries Ridenour, and has put doctors on guard. Dr. Eric McDonald, director of San Diego County’s epidemiology program, said it’s a matter of when, not if, the outbreak reaches Southern California. “I think that the numbers are going to continue at this pace for a while,” McDonald said. McDonald emphasized if you have a fever and that tell-tale rash and fear you might have the measles, call ahead to your doctor before you go in, so they can prepare. According to the CDC website, so far this year 555 individual cases of measles have been confirmed in 20 states. That is the second-greatest number of cases reported in the U.S. since the virus was eliminated in 2000. The states that have reported cases of measles include: Arizona, California, Colorado, Connecticut, Florida, Georgia, Illinois, Indiana, Kentucky, Maryland, Massachusetts, Michigan, Missouri, Nevada, New Hampshire, New Jersey, New York, Oregon, Texas, and Washington. In California, 21 cases have been reported in Los Angeles, Placer, San Francisco, San Mateo, Santa Clara, Santa Cruz, Butte, Calaveras, Shasta and Tehama counties, according to the California Department of Public Health. Of those cases, seven involved patients under the age of 18.